The Wire Fox Terrier was once a formidable vermin hunter. Today, the breed is primarily used for companion dogs that make life interesting for all who know and love them. 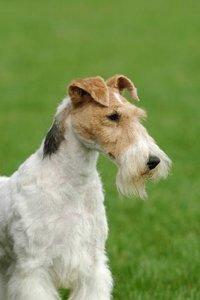 The Wire Fox Terrier is believed to be a descendant of the black and tan Terrier well-known in Wales and related areas. The breed was frequently crossed with the Smooth Fox Terrier to refine the head and reinforce the genetics for the white coat. At one time, both breeds were considered one breed with two varieties. However, the American Kennel Club (AKC) has recognized these breeds as separate since 1985 and interbreeding has ended. The Terrier is a very alert, ready-to-move dog. Proportion is more important than actual size in this breed. These dogs stand 15.5 inches at the shoulder and approximately 12 inches from the shoulders to the base of the tail. The head is approximate 7 to 7.25 inches in length, with the skull and foreface about equal in length. The eyes are dark a set well into the skull, and the ears should be fairly small and folded over. The body is trim and toned with good depth in the ribs. The tail is typically docked to three-quarters of its original length, and should be set and carried high on the rump. The front legs are quite straight, and the rear legs should have good curve to the stifles. The feet should be tight and the dogs should stand well up on their toes. The wiry-textured coat should be thick enough to make it difficult to see the skin when parted. Some waving is permissible, but the coat should not be curly. The main color should be white, and most dogs display coloring on the head and a saddle over the back. Although coloring of these areas is not considered important in the AKC standard, black, brown and tan are preferred. The Terriers have boundless energy and a joyous zest for life that makes them very entertaining companions. They like children quite well, and they love to be included in everything the family does. This is not a breed that takes well to being crated or left behind. They are curious to a fault, and they will find a way to reach almost anything that interests them. These dogs have no notion that they are not huge in stature, and their hearts are big enough to match. They are self-appointed guardians of their territory and find yard varmints and other stray pets irresistible to chase. Strangers are also treated with a bit of wariness. The Wire Fox displays the typical courageous nature found to some degree across all Terrier breeds. This breed's high intelligence does lend them to training well under many circumstances, but house training poses a particular problem. Owners need to be very diligent about maintaining a regular schedule for potty breaks, as well as immediately cleaning up any household accidents with an enzymatic cleaner to remove trace scents. On the whole, it's better if there is someone who can be with the new pet all day long until housebreaking is achieved. Since they are so bright and energetic, these Terriers can readily understand most concepts you try to teach them. The challenge is to keep their interest during training sessions. They tend to get distracted by many things they notice in their environment, especially if you are training outside where they can see other pets and animals. Be prepared to praise immediately for successes, but refrain from losing your temper when there's a mishap or your pet may decide to tune out of training. 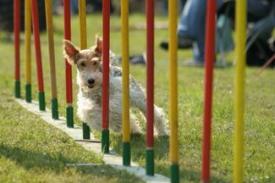 A particular area of training these dogs excel in is canine agility. They really seem to love running through the course and thrive on their trainer's encouragement. Earth Dog competitions allow Fox Terriers to put their inbred hunting instinct to use in a controlled environment where no one gets hurt. Working Terriers need plenty of exercise to keep them healthy and well-adjusted. These dogs need at least 30 minutes a day of vigorous running, playing and walking, although they will go longer if you have the time. Otherwise, a combination of boredom and stress will surely drive them to destructive behaviors like chewing and digging inside the home. Just be careful to have your dog properly leashed or he may not be willing to come back if he takes off after "prey". This could lead to a tragic accident. Mental stimulation is crucial, so provide some interactive dog toys that challenge your pet to figure out how to access a hidden reward. Safe chew toys like Kongs also help relieve stress. To keep your pet looking its best, the occasional trip to the grooming shop is recommended. Other than that, these dogs benefit from the use of a bristle brush to prevent matting. The harsh coat repels most dirt, but occasional bathing is also necessary. The beard on the muzzle should be kept clean and slightly trimmed, and excess body hair can be removed with the help of a stripping tool. On average, the breed is comparatively healthy and lives an average of 12 to 15 years with reasonable care and proper nutrition. The Smooth Fox Terrier is almost identical to the Wire Fox, with the main exception of the Smooth's short coat. Visit AKC.org to compare standards for both breeds.